Pom is an inspired cook who learned her skills at her mother's knee and began her career in the culinary school business in 1993 when she joined the Chiang Mai Thai Cookery School. Having risen to office manager, she left the school in 2009 to found the Cooking@home Thai Culinary School so that she could share her enthusiasm and passion for cooking through a school of her own. Pom delights in inviting her student guests to cooking@home so that she can share some of her favorite family recipes with them. 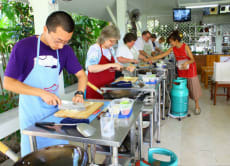 By accepting her invitation you will be introduced to the very best in traditional Thai Cooking and she will teach you how to cook her signature dishes - recipes passed on from generation to generation in Pom's family, to which she has added her own personal touch, developing them to assure perfect results every time.